On Monday 26 November 2018 Ana Quiros, Maria Jesus Ara, Beatriz Huber and Ana Ara were called in to immigration. Quiros was then taken to the El Chipote interrogation prison and subsequently driven to the Costa Rica border. The Havana Times of 27 November carries a long piece on this. “Daniel Ortega and Rosario Murillo’s regime has just raised the level of their harassment against feminist movements, in a day of abuses that culminated on Monday with the expulsion from the country of feminist leader Ana Quiros” write Juan Carlos Bow. Quiros is a Costa Rican and Nicaragua dual citizen who has lived in Nicaragua for more than 40 years – the entirety of her adult life. Along with Quiros, three European women living in the City of Matagalpa for decades, were also cited by immigration without any explanation to appear on Monday at their offices, where they were held for hours and then had their permanent residency revoked. The authorities refused to allow them to be accompanied by lawyers or human rights defenders. The Ara sisters are Spanish and Huber is Swiss, all had current permanent residency status. Quiros was born in Costa Rica and is a Nicaraguan national since February 1997. All are part of the national feminist movement that has criticized the repression of the Ortega regime and its responsibility for the death of at least 325 Nicaraguans. Last week the regime blocked activities of the feminist movement to commemorate the International Day for the Elimination of Violence against Women, which is held annually on November 25th. Before presenting herself at Immigration, Quiros offered a press conference in which she stated that “the dictatorship must be clear that we are going to continue raising our voices, saying strongly that we want a free homeland in which to live.” “I chose to be Nicaraguan and I feel I have the right to demand that my rights be protected, to demand that in Nicaragua there be peace, justice and freedom, and to repudiate the abuses and arbitrariness that they have committed: the murders, the prison and the kidnapping of all those Nicaraguan brothers and sisters, who only want and are asking for a better Nicaragua, a Nicaragua where we all fit, where no one feels that they are above anyone else,” said Quiros. This is the second time that a government tries to silence the critical voice of Quiros, who is a specialist in public health. In 2000, the administration of Arnoldo Alemán tried to strip Quiros of her Nicaraguan nationality, after she publicly pointed out the acts of corruption of the liberal party president. Vilma Nunez, of the Cenidh, lamented the expulsion of Quiros noting that the Ortega government has exceeded its intolerance against everything that annoys and bothers it. “…Nuñez said that the citation of Quiros and the other three feminists “has no legal value because it did not state why they are being called in.” ….Nunez said that in order to revoke someone’s citizenship, a trial must first be held, which has not occurred in this case. The Geneva Human Rights Platform (Geneva HRP), hosted by the Geneva Academy and supported by the Federal Department of Foreign Affairs of Switzerland, provides a dynamic forum in Geneva for all stakeholders in the field of human rights – experts, practitioners, diplomats and civil society – to discuss and debate topical issues and challenges. Relying on academic research and findings, the Geneva HRP aims at enabling various actors to become better connected, break down silos and, hence, advance human rights. ‘The objective is to foster interactions and discussions on topical issues and challenges through regular events, conferences, expert roundtables and private meetings’ stresses Felix Kirchmeier, Director of Policy Studies at the Geneva Academy. ‘The Geneva HRP aims to increase sharing, exchange and collaboration among different actors by means of its independent, neutral and academic status’ adds Robert Roth, Director of the Geneva Academy. The Geneva HRP is up and running since the beginning of the year, but now has a dedicated online presence, on the Geneva Academy website, which provides information about activities, events and related research. Two major cases of universal jurisdiction – after years of work – have finally borne fruit in the month of April 2018: One verdict in Switzerland (Sperisen) and one in the Democratic Republic of the Congo (Colonel “Marocain”) make the case that the mobilization of human rights defenders and civil society can really make a change. Frédéric Burnand for Swissinfo reported on 26 March 2018 that the UN Human Rights Council in the end adopted the Chinese draft resolution that I referred to earlier: [https://humanrightsdefenders.blog/2018/03/07/china-and-the-un-human-rights-council-really-win-win/]. The Chinese resolution calling for “mutually beneficial cooperation” on human rights issues was adopted at the United Nations Human Rights Council last week, but human rights defenders and several countries say it actually weakens human rights principles. “The Chinese resolution is the first stage of a major step backwards,” Geneva-based human rights specialist Adrien Claude Zoller told swissinfo.ch, calling it “THE major event” of the Human Rights Council’s 37th sessionexternal link. At first glance, Beijing’s resolution at the Human Rights Council – only its second-ever in nearly a dozen years ! – seems relatively innocent. The text, full of diplomatic language such as “universality” and “international constructive dialogue”, was adopted on Friday evening by 28 votes to one, with 17 abstentions. While welcoming “constructive international cooperation as a means of promoting and protecting human rights”, Switzerland’s ambassador to the UN in Geneva, Valentin Zellweger, stressed that human rights-related mandates need to be able to act quickly and work efficiently to prevent crises. Civil society, he added, must be able to play a crucial role in protecting against and addressing violations. John Fisher, the Geneva-based director of Human Rights Watch, also criticised China’s strategy. His organisation last year issued a reportexternal link warning of Chinese interference in UN human rights mechanisms. The United States cast the only “no” vote on the resolution, co-sponsored by states including Pakistan and Egypt. US diplomat Jason Mack said China was using its resolution to try to weaken the UN human rights system and norms. “The ‘feel-good’ language about mutually beneficial cooperation is intended to benefit autocratic states at the expense of people whose human rights and fundamental freedoms we are all obligated as states to respect,” he said. He added that Chinese spokespeople had clearly been trying to “glorify their head of state by inserting his thoughts into the international human rights lexicon”. On Monday, China accused the Americans of arrogance for rejecting the Chinese resolution. “I think the comments by this US official in Geneva…were extremely unreasonable, and also reflect the consistent ignorance and haughtiness of the US side,” Chinese Foreign Ministry spokeswoman Hua Chunying told a daily news briefing. Many countries expressed at the meeting that the Chinese resolution reflected the common wishes of the international community and helped raise the ability of developing nations to speak for themselves on human rights issues, Hua added. 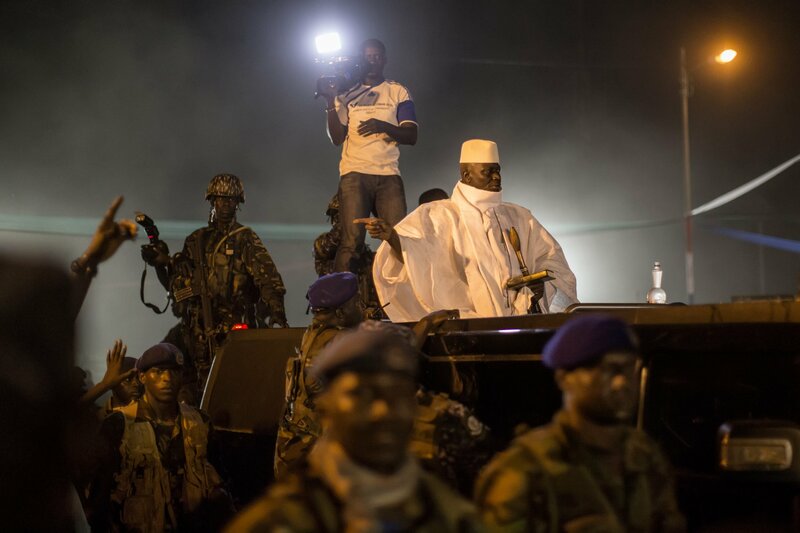 Ousman Sonko, a former interior minister of Gambia suspected of human rights abuses who was arrested in January 2017, will have to remain in Swiss detention, the Swiss Federal Tribunal has ruled. Switzerland’s highest court has rejected an appeal by Sonko’s lawyers against a second prolongation of his detention. The Federal Tribunal said in a decision published in December that Sonko was still under urgent suspicion. As in a previous judgement on an appeal by Sonko, judges said they based their decision on independent reports by United Nations special observers on Gambia. These observers had not yet been questioned by the Office of the Attorney General (OAG) and the OAG also needed to go through files obtained from Gambia during the mutual assistance procedure, the latest judgement said. Trial International, an international justice organisation, accused Sonko of having personally taken part in what it described as torture between 2006 and 2016. Sonko served under ousted Gambian leader Yahya Jammeh. “As the head of detention centers, Sonko could not have ignored the large-scale torture that political opponents, journalists and human rights defenders suffered there,” said Benedict de Moerloose of TRIAL in a statement in 2017. Barrow, the new President, had stated that he plans to install a truth and reconciliation commissionin the country in order to take account of alleged abuses under Jammeh, before deciding whether to attempt to prosecute the former president. In May 2017 in the wake of the launch of its global ‘brave’ campaign”, the Regional Director for West and Central Africa of AI, Alioune Tine, had called for justice for United Democratic Party (UDP) activist Ebrima Solo Sandeng, and for all victims of the Jammeh regime. “There must be justice for Ebrima Solo Sandeng and for all victims,” Alioune Tine told Freedom Newspaper. Alioune Tine said that, during his meeting with President Adama Barrow, he received assurances from the Gambian leader that there would be ‘zero tolerance’ for human rights abuses. Having reported in 2014 on the fate that had befallen Gulnara Karimova, daughter of the former Uzbek dictator [https://humanrightsdefenders.blog/2014/08/22/how-the-mighty-fall-in-uzbekistan-gulnara-karimova-asks-human-rights-protection/], I now feel that I should follow-up by referring to media reports (Reuters Almaty) that she is in fact being detained over fraud claims. Uzbek Prosecutors have revealed that Gulnara Karimova, who has not been seen in public for three years, was convicted of embezzlement already back in 2015. Gulnara Karimova’s lawyer has raised concerns about the welfare of the socialite. The prosecutor general’s office said it was seeking to freeze about $1.5bn (£1.15bn) in assets held by Karimova in countries including Switzerland, Sweden, Britain, France, Latvia, Ireland, Malta, Germany, Spain, Russia, Hong Kong and the United Arab Emirates. Karimova could not be contacted for comment. Her Swiss lawyer Gregoire Mangeat said he did not know where she was being held and revealed that he had been forced to cancel a visit to see her this month. “The methods and behaviour adopted by the Republic of Uzbekistan thereby constitute a serious violation of the most fundamental human rights guarantees,” Mangeat said. Sustainability and diversity: The committee members received an update about FIFA’s concrete measures in the areas of anti-discrimination, environmental protection, social development and sustainability, in particular in the context of the upcoming FIFA World Cups™. Human rights: In line with FIFA’s commitment towards human rights enshrined in the FIFA Statutes and FIFA’s 2.0 vision, the committee discussed FIFA’s responsibilities in this area, as well as the key aspects of a FIFA human rights policy, which will eventually be submitted to the FIFA Council for approval. Integrity in football: While the Governance Committee does not intervene in sports regulatory matters, it was agreed that it would conduct an analysis of the economic and social dimensions of football regulation that intersect with questions of human rights, transparency and conflicts of interest and that may impact on the integrity of the game and public trust. ……Following the meeting, the chairman set up two working groups to work on the human rights policy and the electoral guidelines, to be coordinated by committee members Justice Navi Pillay (former UN High Commissioner for Human Rights) and Joseph Weiler (Professor at New York University Law School and former President of the European University Institute) respectively. The Permanent Missions of Costa Rica, Finland, and Switzerland to the United Nations, together with Amnesty International and the International Service for Human Rights (ISHR), are organizing a side event in the margins of the General Assembly’s 71st session in New York on 24 October 2016 on the topic of: Implementation of United Nations human rights treaty body recommendations. The event will take place at 3pm in Conference Room 6 of United Nations HQ in New York. Some of the question to be discussed are: How can implementation of human rights treaty bodies’ recommendations be strengthened? What progress has there been in the area of follow-up and implementation since the High Commissioner’s 2012 report on strengthening the United Nations human rights treaty body system and Resolution 68/268? What are the national mechanisms for reporting and follow-up (NMRF) and which models have been the most effective in different States? The discussion will focus on tools to encourage engagement and compliance with human rights treaty body recommendations in order to improve the promotion and protection human rights for all, including the treaty body follow-up procedures, national mechanisms for reporting and follow-up, and the role of civil society. Speakers will include representatives of treaty bodies, OHCHR, civil society, and government. For more information, please contact m.sinclair@ishr.ch. On 4 February 2016 Penal Reform International, the Quaker UN Office, and the Permanent Representations of Switzerland and Uruguay to the UN in Geneva, invited delegates, representatives of NGOs and interested stakeholders to a briefing in the Palais des Nations in Geneva on the recently adopted revised UN Standard Minimum Rules for the Treatment of Prisoners, the ‘Nelson Mandela Rules’. An expert panel provided an overview of the revision process and the significance of this set of standards, and then focused on a number of critical areas of the Rules that were updated. It sought to initiate discussion on the implementation of the Nelson Mandela Rules and to start collecting recommendations and good practice in this regard. · Andrea Huber, Penal Reform International. The video – prepared by True Heroes Films (THF) – is on the long side (1 1/2 hours) but is excellent for people who want to learn more about the revised standards.